We followed the road going to the right, and after some time I saw more light (we were walking under mango trees), and we came upon what looked like a dry river bed with huge boulders, and even a little water. We decided to have a short break. 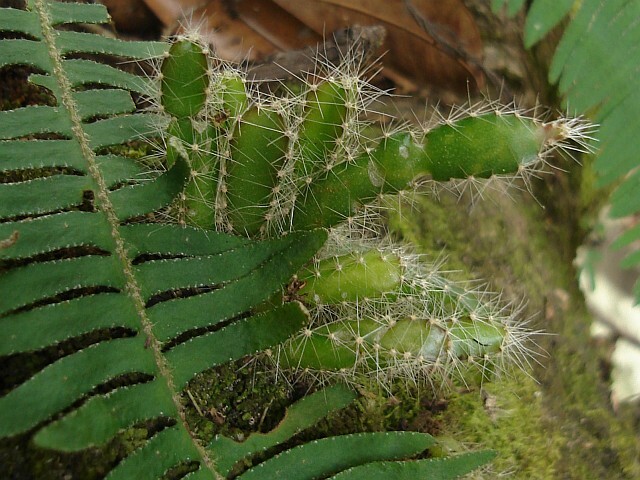 Edible cactus growing on a tree. Since I can't really sit still (I am quite restless), I looked around a bit, and noticed a small group of cactuses growing on a tree. Esme joined me, and told me that this species was edible, cooked that is. 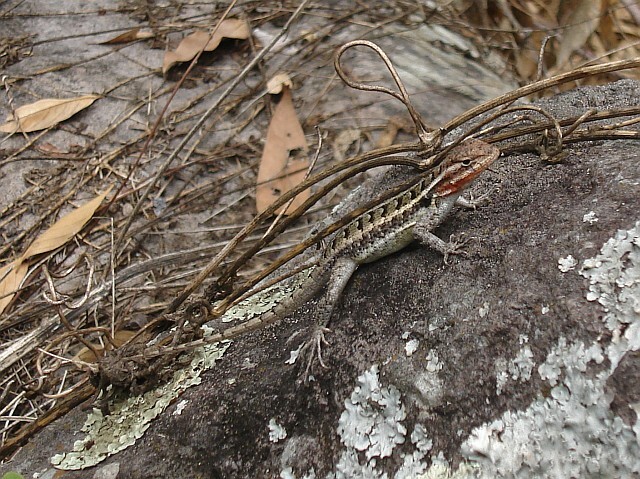 A lizard on a stone. We continued our walk by moving a bit up on the dry riverbed, climbing a few boulders, and then we left the riverbed and entered another mango grove. I looked under a stone covered with moss, and lightning fast an arachnid run to the top of the stone. Its color is very close to the color of the moss, so it's quite hard to see. 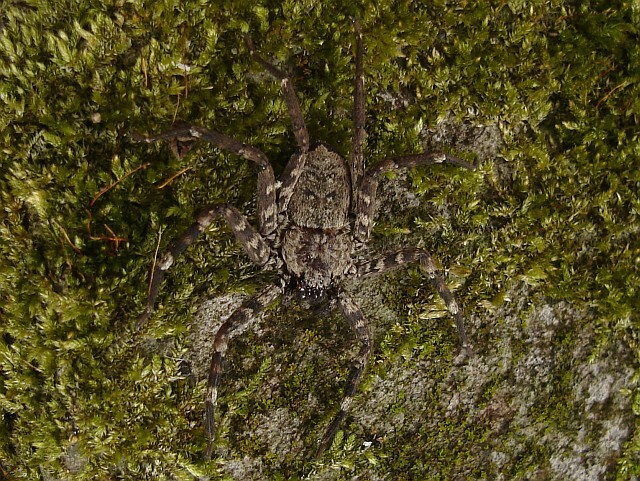 An arachnid on a stone with moss. 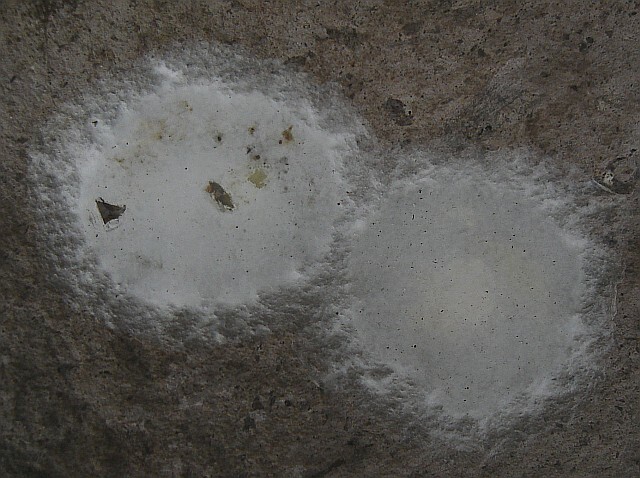 On the underside of the stone I noticed to white circles. It looked like they were made out of webbing. Did those protect the eggs of the arachnid? And why are there two of such circles? Webbing made by the arachnid? We got deeper and deeper in yet another mango grove. It was quite hot and the air felt very humid. I kept looking under stones, which probably together with wearing a backpack, contributed a lot to how I was feeling: hot and sweaty (sorry ladies). There were plenty of stones, but some couldn't be moved. 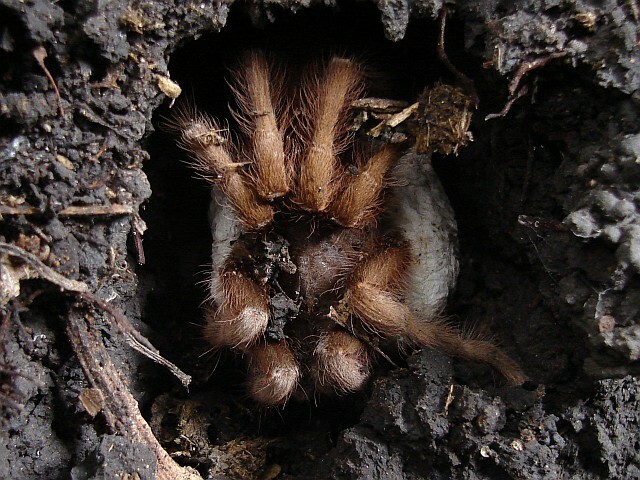 Others looked often too small to hide anything, yet under a relative small one I spotted a big female tarantula, hiding in her burrow, with an egg sac. Since we considered this a place where we could probably find more interesting animals we both started looking under more stones. Some stones were stacked up into quite big piles, and removing one revealed many hiding places which would take a lot of time to uncover. So we went for the single boulders that looked like they had been in the same spot for quite some time. 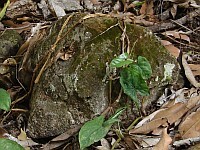 And under one such stone, quite a flat one, which merely rested on the ground, I saw a big vinegaroon. 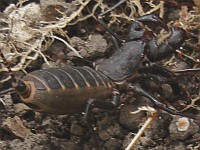 A vinegaroon, with the remainders of its meal. 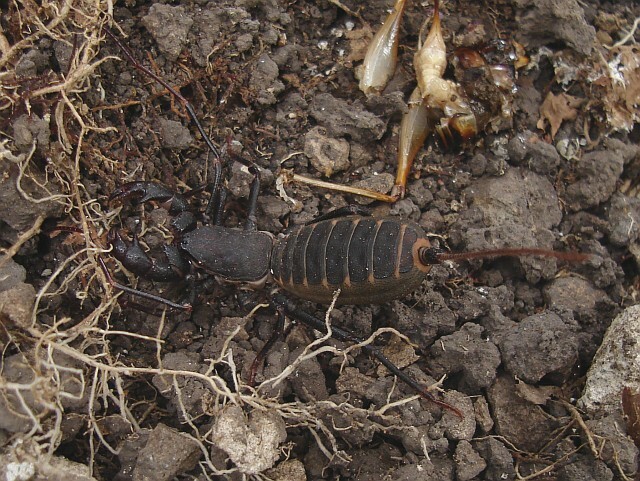 I had seen a vinegaroon (also called a whip scorpion or vinegarone) a few times before in Mexico, but not this big, it was about the size of my thumb, so the body length, head to tail, was about 5 cm, and the width of the body about 2 cm. 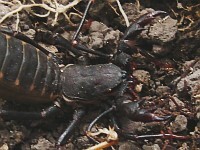 Next to it we saw remainders of what looked like a big cricket. 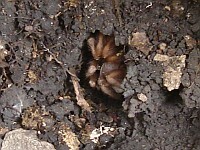 It probably had been eating when I uncovered it. 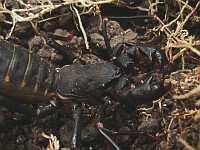 After a short photo session, the vinegaroon had enough of us, and hid in a hole which might have been its burrow. We could clearly smell vinegar, so I probably had annoyed it more then enough when taking pictures. 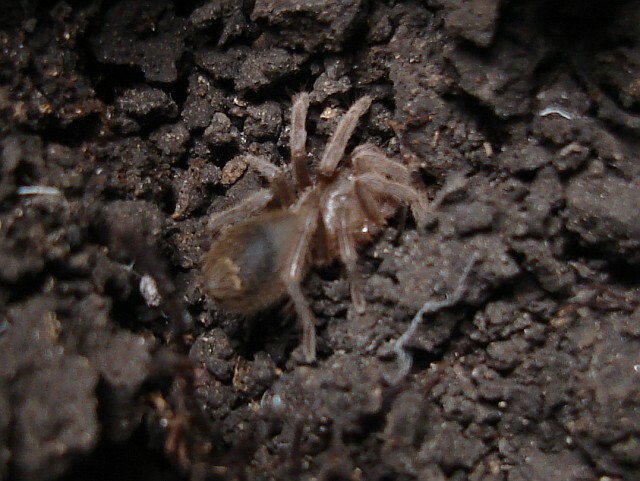 We continued our walk and found a few times very small (1 - 1.5 cm) juvenile tarantulas, which were often able to hide before I had the Sony DSC-S600 digital camera ready. 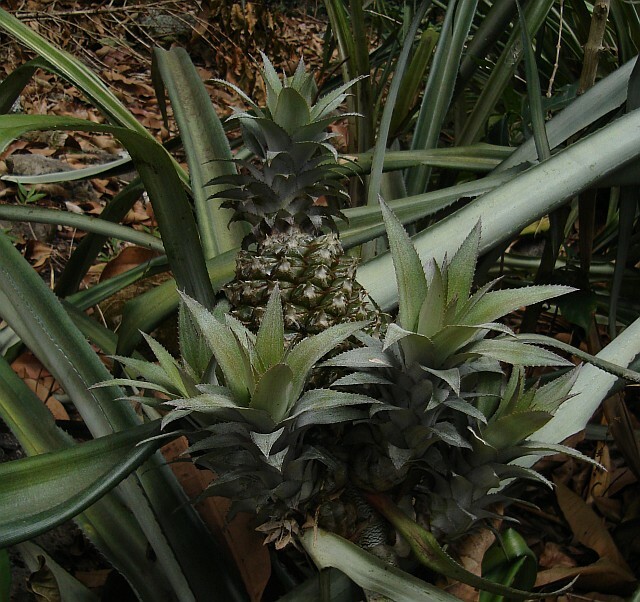 Pineapple plants growing in a mango grove. Suddenly Esme spotted a group of pineapple plants. We hadn't seen those before that day and it looked really nice, those plants growing under the mango trees. 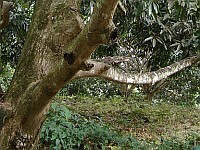 The fruit was quite small, like 10-15 cm.